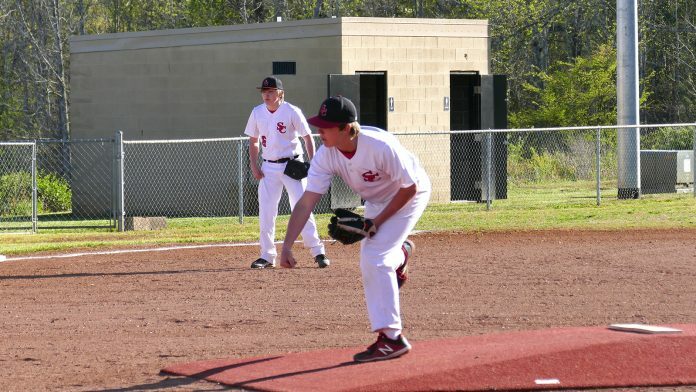 Spring City, TN — Spring City Middle School baseball’s unbeaten season was in peril as they looked up at a 5-0 deficit against North Middle after two innings on Thursday night in Spring City. The Bulldogs brought in Austin Brackett and Brackett stemmed the tide and the Bulldogs offense finally broke loose in the bottom of the fifth inning for four runs to tie the score at 5-5. Nobody scored for three innings as game went to extra frames. In the top of the ninth inning North Middle broke the scoreless streak with a run as Randolph and Carrol led off the inning with singles and Randolph scored the go-a-head run. The stage was set for some heroics from the home standing Bulldogs. Five batters came to the plate and one made an out. Austin Brackett opened the inning with a walk and Jeremy Easter followed with a double. Fugate walked before Wolfe and Fisher came through with singles. The single by Wolfe plated the tying run. The single by Fisher plated Easter with the winning run and Bulldogs had won via the walk-off single. For the game Brackett, and Fisher each had three runs batted in and Wolf had one. Easter had two doubles to lead the hitting, while Brackett, Wolfe and Fisher had singles and Fisher had a double to add to the hit column. Austin Brackett pitched seven innings, giving up only one run, while striking out seven batters. With the win the Bulldogs record stands at 13-0. The two wins against North are satisfying as Spring City lost two games to North last year and the last ended their post season play. Games are cancelled for Monday and Tuesday, due to rain in forecast. Reschedule dates are not available at this time.